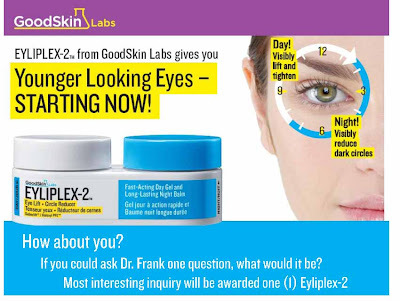 GSL Gives: Eyliplex-2 + My Q&A with Dr. Frank --- CLOSED!!! Good morning and Happy Start of the week friends! Today, something exciting is in store for everyone! Another giveaway care of our friends from GoodSkin Labs! Before I talk about the contest details, I was one of the few chosen bloggers who were lucky enough to get my questions out there! I did some research before I come up with the 3 questions, to those who doesn't know who Dr. Frank is, kindly click photo below to read his profile! It doesn't hurt that the Doctor has wonderful skin! AMW: Hi Doctor, what are the top ingredients in a skincare product that can possibly cause allergic reactions to users? Dr. Frank: It is hard to say which ingredients could cause allergic reactions since our skin is unique to us and we may react differently to different products. It is best to ask your dermatologist about ingredients you may be unsure of. AMW: Is it really better to use a skincare regiment coming from the same brand or is it okay to mix and match? Dr. Frank: It is okay to mix and match your products! The great thing about GoodSkin Labs is that they have the products that fit into your skincare routine. 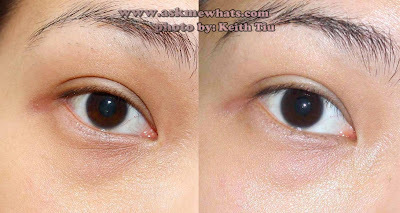 For example, if wrinkle between your brows is keeping you up at night, then GoodSkin Labs Tri-Aktiline Instant Deep Wrinkle Filler can be used with your regular skincare products to help spackle over and shorten that wrinkle over time. Just remember, introduce new skincare products one at a time and give skin time to adjust to those new products (2-3 weeks is a good rule of thumb). By using too many new products all at once, skin will become irritated. AMW: A lot of people may have suffered acne during their teenage years and may have left with scarring in their adulthood, is there a good product out there or a way to help lessen the look of scars without going through dermabrasion treatment? Dr. Frank: I love Smooth-365 Intensive Clarity + Smoothing Peptide Serum because it delivers silky smooth skin, as it blurs away imperfections for a youthful and even complexion. It's formula kicks natural collagen production into gear to help firm skin and lift away the appearance of unwanted creases. Should you have more severe acne scars, talk to your dermatologists about the best way to hide these marks. Because of its effectiveness, I gave one to my sister and she finished her Eyeliplex-2 last year and told me she loved it too! 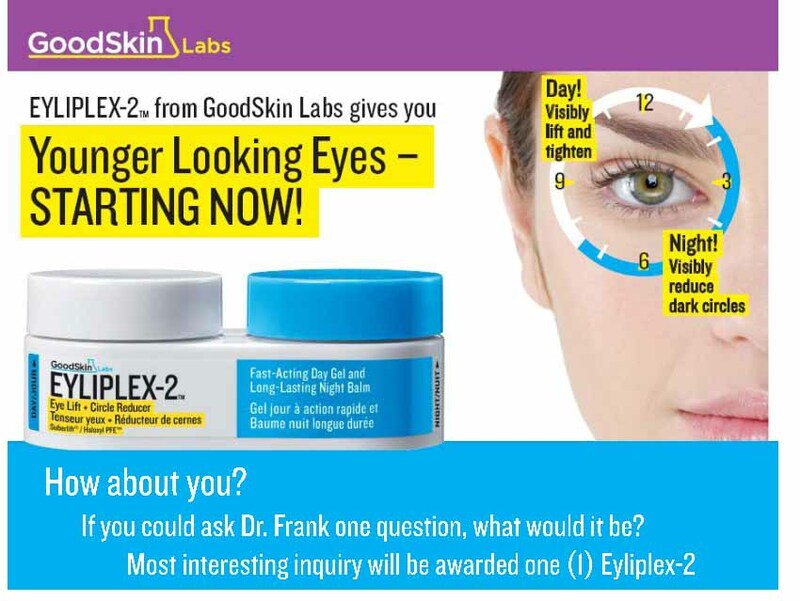 Send your most interesting question for Dr. Frank via email (goodskinlabs.ph@gmail.com) with the subject: AskMeWhats Q&A together with your full name, age and mobile number. One winner will be chosen by GSL Philippines and myself. Contest is open to Metro Manila residents only as redemption of prize will be at Estee Lauder Office - Buendia, Makati. Contest runs February 6-12, 2012. Though this contest is base on email entries, I would love to know through comment box if you are joining and maybe, tell me a bit about your skin condition! 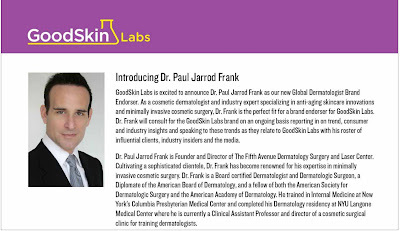 Feel free to LIKE GoodSkin Labs Philippines on Facebook to know who were the rest of the bloggers who get the chance to ask Dr. Frank some more skin related questions! I'd love to read his answers! I want to join. I have combination skin with freckles on my cheeks. My current problem now is my pre mature wrinkles on my under eye. I'm not using any eye cream. In my age, I read in one forum that I need to start using eye cream now. i have joined. Combination skin too, always oily on t-zone area. Thanks for the contest. Hi nikki, I just joined. I have combination skin type. Thanks. Hello Nikki Eonni! I joined! My skin condition is... a little oily.